Remember when you were young, wild and free? It seems like it was just yesterday when in fact it was over ten years ago. Nothing holding you back from where you wanted to be. Days filled with workouts, pool side naps, mani/pedis, champagne lunches....man, those were the good ole' days. Alas, those days are gone and now my days are filled with little boy laughter (and screams) and lots and lots of love. But hey, a mommy can reminisce right? What are you doing to celebrate this beverage filled holiday falling on a Friday? Plans out on the town? Biking and bar hopping on the coast? Tasty green treats for your husband and kids with super fun art projects...oh wait, that's me. Even though I won't be cheers-ing with the rest of the Guiness drinking world...at least I know what I would be wearing and what I would have in hand! I would surely be rocking this adorable Chummy Tees top with my favorite high waisted (duh), flea market, Levi's cut offs. 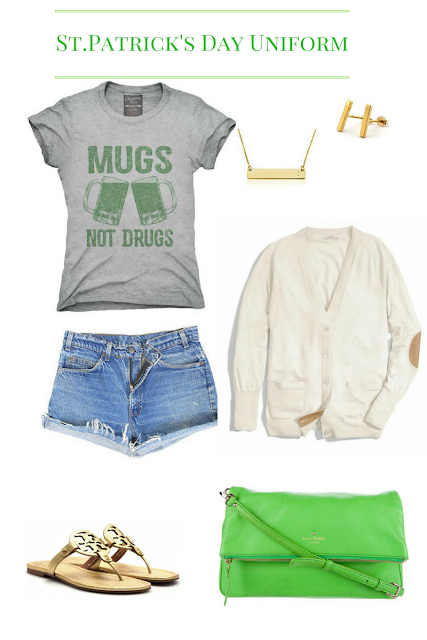 With my boyfriend cardigan close in case it gets chilly and some Pot o' Gold Tory Burch Miller's I am ready for anything! To top off my look I would of course add my gold bar collection and a green Kate Spade cross body. I am feeling quite good about this ensemble I am not wearing...quite good. 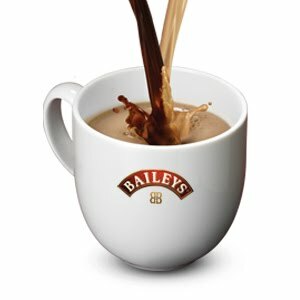 I'd start with some Bailey's and coffee...you know to get a jump on the mornin'. 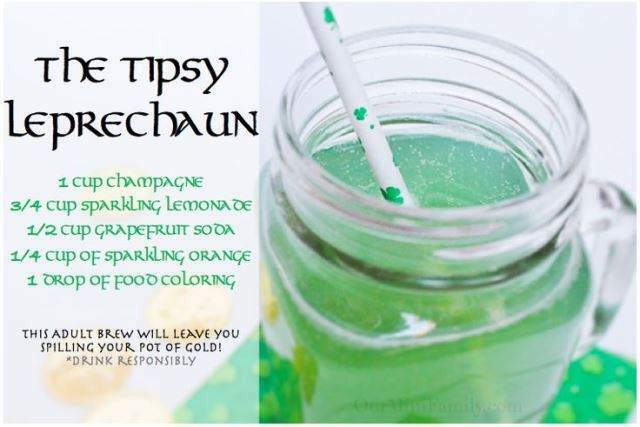 I'd most likely keep it light and sparkly with a Tipsy Leprechaun...or two. 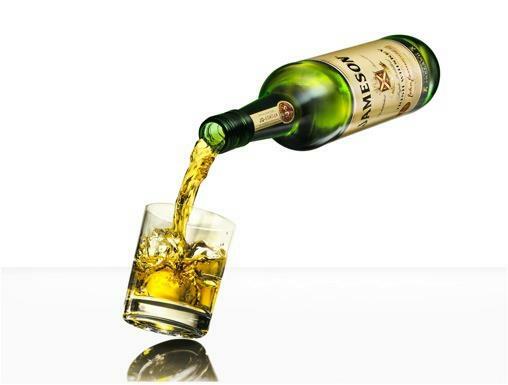 Lastly, I'd end the night with some Jameson as I do love me some whiskey. Yikes, this makes me sound quite old...oh wait, I am. Well, at least I can wish for this outfit and day of cocktails on the next rainbow. Enjoy the weekend and drink as responsibly as any other 30-something Thriving Wife with kids would!